Yet another superb app has been added by Microsoft in its Windows 8 app store, Snapy. Yupp…you guessed it right. It’s the same slideshow creator for Windows 8 that lets you create slideshows in a just a few minutes. And yeah..the slideshow creating app is absolutely free to download in Windows 8. The interface of Snappy app for Windows 8 is very simple and easy-to-access. On opening the app, you will find two options –“New Slideshow” and “See All Slideshows” given under the “Start” column. The HD resolution of Windows 8 screen makes your slideshow presentation even amazing and beautiful. Lets learn more about these two options. This will bring you various options as to what kind of slideshow do you want to create i.e Documents slideshow, Music slideshow, Pictures slideshow, or Videos slideshow. Foe example: I created a slideshow of pictures, hence, I clicked on “Pictures”. Now, under the “Pictures”, it will show you “Picturethrill” that includes the pictures you have downloaded, and “Webcam” that includes the pictures you captured using Webcam. You can now select the pictures with which you want to create a slideshow, else you can click on “Select All” option in case you want to add all the displayed pictures. Yupp….you are done. Well, as you explore deep inside the options available in creating a new slideshow, you will be soon able to create one. In addition, you can also sort the slideshows by name or by date which indeed becomes easier for you to add files for creating slideshow. The other option given is “See All Slideshows” that lets you view all the slideshows you have stored in Windows 8 Snapy App. Click on the ones you want to play. 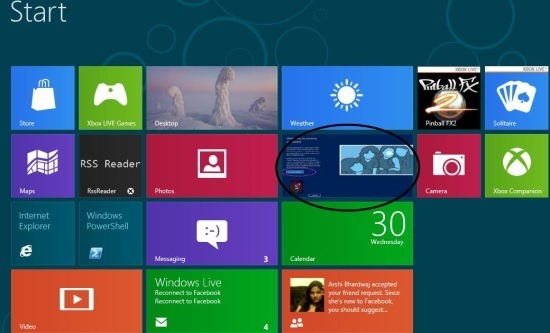 You should not miss out Windows 8 Tutorials posted by us. In short, Windows 8 Snapy app to create slideshows is an amazing addition to Windows 8 apps that Microsoft has done.